It’s already March and spring is here in Madison! In spring, girls always get excited to take out their colorful clothes from their closets and wear them. 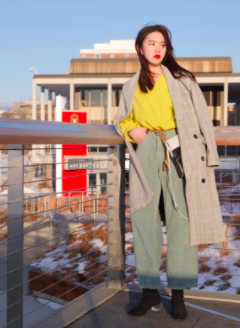 This week, I traveled around campus and looked for the most fashionable spring outfits. Among many stylish clothes, three students’ outfits stood out to me. First, the outfit YingYuan Zhang has going on really fits with our spring theme. Her yellow sweater matches well with her loose, light-green pants. The light-brown belt not only makes her look skinny but prevents her top and pants from clashing colors so abruptly. While her top and bottoms are brightly colored, she chose to match them with black boots, softening the whole color of the outfit and bringing maturity. Since the weather in Madison is not as warm as other places in the country, I strongly recommend wearing coats as layers like Zhang did. Her checked coat has the same style as her black boots paired with her white and black handbag, adding coolness to her whole style. Narik Riak chose a little different style than Zhang did. Her outfits are actually more suitable for warmer weather than now. She definitely used the most “spring” element: denim. Only wearing denim products tends to be boring, so she matched her light denim vest and dark denim shorts with a yellow tank top, making her whole outfit brighter. Since the weather did not get warm enough for just shorts, I highly suggest wearing leggings under your shorts to keep you warm just like what Riak did. Riak’s casual outfit needed casual shoes, so the pair of Adidas’s are one of the best options for casual. Lastly, Yuwen Zhang’s outfit was a standout. Her black long-sleeve shirt is simple, but the white logos made it unique and flat-out cool. To match with her black shirt, she chose to wear light-denim ripped jeans. Recently, ripped jeans are very popular among all genders. The contrast of colors between her top and bottoms works perfectly to go with her Air Jordans. In spring, fashion is important, but keeping warm is also very significant because seasonal changes in clothes are very likely to cause colds and other illness. Remember, you can look good and stay acclimated at the same time on campus.